* Manual Therapy: your PT will spend 10-20 minutes of hands on therapy consisting of focused massage of the plantar fascia and surrounding muscle groups in the calf that demonstrate tight bands or knots. Hands on joint focused stretching may also be needed for the ankle joints as well. * Physical Agents: the use of treatments such as ultrasound that can provide heat to the painful tissue to allow for increased blood flow. This can warm up the tissue in preparation for the massage and also increase blood flow which is good for healing. * Unloading: there are many options in this category. An initial round of specific taping to support the arch is helpful to help take some initial stress off the painful tissue. Transitioning from the tape to an off the shelf orthotic is the next transition. I have good results using Superfeet (www.superfeet.com), a very nice and affordable orthotic. Off the shelf usually works great. Though more expensive, a custom orthotic can be fit for you at the Fit Stop, if the off the shelf option is not successful. * Stretching: In my opinion, probably the most important part of the plan. A simple home stretching routine should be followed with consistency for optimal results. So here it is! The moment you’ve been waiting for! 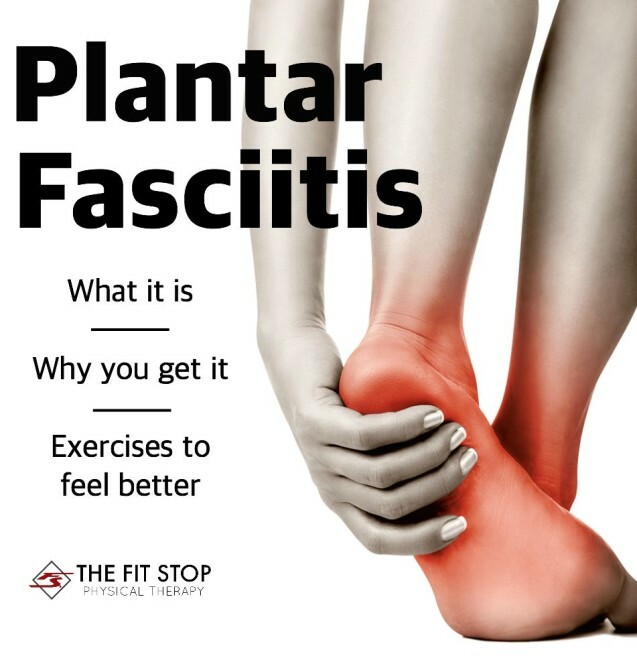 Check out our go-to exercises for the treatment of plantar fasciitis. Simply click on the image below to open the PDF in a new window/tab where you can save it to your computer/device. Please keep in mind this is a routine specific for PF, so it may not be beneficial if you are dealing with a different condition. If you suspect you may have plantar fasciitis don’t hesitate to contact us! We would love to provide you with the tips, tools, and treatment that will ultimately result in decreased foot pain.